With Worthy Farm opening its gates next week for the highly anticipated Glastonbury Festival, I thought it would be a great time to look into less well-known festivals around the world. Nowadays there are few ways you can truly experience society’s ancient traditions and culture, but festivals remain to be one of the best ways to really immerse yourself into culture and appreciate traditions. At Mountain Kingdoms, we want to protect society and for our clients to experience other ways of life. We therefore go off-the-beaten-track and have several trips that coincide with festivals. Each week on Mountain Kingdoms Facebook & twitter we choose a theme for an ‘Inspirational Photo of the Day’, and last week’s theme was festivals. Each day features a post dedicated to a particular festival which can be experienced by our clients on our trips. I chose five festivals to focus on, including Naadam, Initi Raymi, Paro Tsechu, Saga Dawa and Theyyam. Each of these festivals are primarily religious celebrations - a contrast to Glastonbury which is more widely popular for its high profile musical artists over its hippie roots. However, there is one element that I believe every single festival has in common, and this is unity. Festivals, no matter what the celebration, is a place where people can belong and enjoy a shared interest amongst other like-minded people. At Naadam Festival in Mongolia, also known as the Three Games of Men, locals perform wrestling, horse racing, and archery contests.This fun, vibrant, and colourful festival takes place in July and can be attended during our Genghis Khan Trails trip. Initi Raymi Festival is celebrated in Peru, and is also known as the Festival of the Sun. June 24th is a day in which the locals of Cuzco celebrate the importance of the sun in Inca culture. It is also the date of winter solstice, when the days begin to get longer. On this day, locals perform parades and re-enact the Inca ceremonials in the spectacular ruins at Sachsayhuaman. Paro Tsechu is one of the most popular Bhutanese religious festivals. It is a celebration bursting with colour and culture. They celebrate through dance performing in extravagant masks and costumes in which tourists are able to enjoy from the courtyard in Paro. Several of our trips to Bhutan have the advantage of visiting this festival. 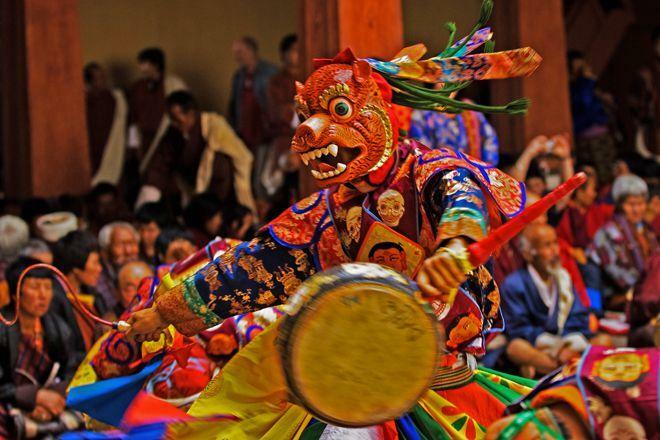 You can discover more about Bhutanese festivals here. Saga Dawa takes place every May/June in Tibet. Each year thousands of Tibetans descend on Mount Kailash to commemorate the three most important anniversaries in Buddhism - the birth, enlightenment and death. Theyyam is a religious festival that takes place in over 1000 temples across Northern Kerala, and can be visited on our Spice Trails of Kerala & Southern India trip. Theyyam performances are based on the myths and stories of the many gods and celestial spirits in Kerala mythology, with wild drum beats, indigenous dancers and enchanting narratives. To all the festival goers this year, I wish you an amazing and enchanting time!